We are doing this project at an upcoming Kids Craft Program at a local library. Although this project looks elegant, it is relatively very easy for a child to do (2nd - 5th graders, with the assistance of a parent). The hardest part is the "punching" and I normally do that part for them. I love this stampset, Baroque Motifs and Chocolate Chip ink! The paper for the wooden, magnetic clothes pin is 1 5/16 x 5 11/16. Cut two pieces, for the front and back of the clothes pin. Adhere with SNAIL adhesive (or glue of your choice). 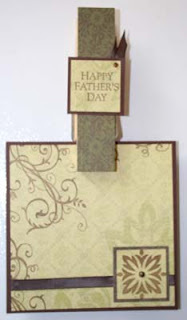 Cut 2x2 Chocolate Chip cardstock as a mat for the greeting. Very Vanilla piece 1.75 x 1.75 for actual greeting. Cut a piece of Chocolate Chip Taffeta ribbon and fold. Place behind greeting and punch through the greeting and ribbon (using 1/16" Circle Handheld Punch). Put Vintage Brad through. Adhere greeting to clothes pin. Cut a 6x6 piece of Chocolate Chip cardstock (plain, but textured may have even looked better). Cut a piece of 5.75 x 5.75 designer series paper (Brocade Background, light green patterned paper). Stamp the large swirl in Chocolate Chip ink, three times on the designer series paper. Wrap Chocolate Chip Taffeta ribbon around the designer serices paper. Adhere. Glue the designer series paper onto the 6x6 Chocolate Chip cardstock. Cut 1.75 x 1.75 piece of DSP (the same pattern used in step 6). Stamp large motif in Choc. Chip ink on that piece of paper. Mat to a 2x2 square of Choc. Chip cardstock. Punch in the center of the motif and place Vintage Brad. Adhere motif to finished 6x6 page (using Dimensionals or SNAIL adhesive).